This weekend in 1937 brought record high water along the Ohio River, including the second highest crest on record in Pomeroy at 67.80 feet on January 28, 1937. 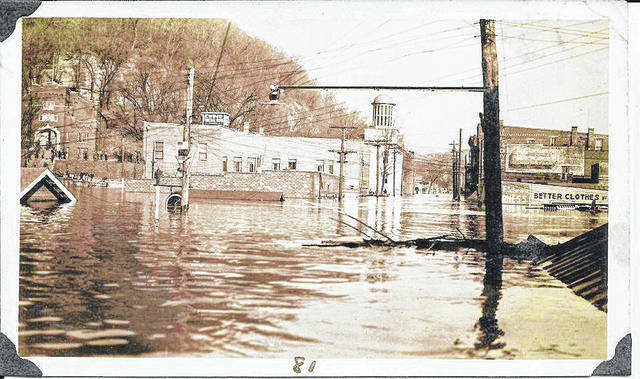 The 1937 flood crested just one foot shy of the 1913 flood, according to records from the National Weather Service. This photo from John P. Scott looks north onto Second Street from intersection of Butternut during the historic flooding. Scott’s photos from around Pomeroy during the flood can be found on the Meigs County Historical Society Facebook page and include “Then and Now” photos which were taken by Jennifer Harrison and Mary Wise in 2012 to mark the 75th anniversary of the flood.